Camera surveys are carried out for various reasons – if an appliance is to be fitted to an existing chimney the Hetas installer needs to be sure that the chimney is in good condition. Smoke tests can be carried out but possibly this is not enough? In a recent example Chimneyline operatives were asked to fit a solid fuel open fire at a property. An inspection was carried out on the newly built chimney. On the visual inspection it was found the Clay pot liners were fitted upside down (socket facing down). This was discussed with the client. As the liners were of a socket and spigot type the socket must be facing up when installed. This is to eliminate any moisture seeping out of the joint so seepage will inevitably cause damp patches on the internal décor. 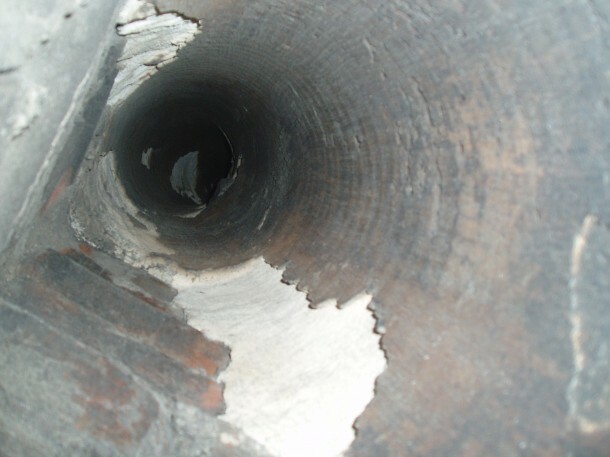 A camera survey was completed which to expose gaps in the joints where the chimney turned (bend). Apparently the Builders contracted by the client to build the chimney had just cut the clay lines at angles to create a bend, therefore there were no Socket/Spigot joints on the bend. As the camera survey discovered this fault we were unable to fit the solid fuel open fire. Option two was agreed and the most practical for the Solid fuel open fire. Camera surveys are requested by: Insurance Companies, Local Authorities, National Trust, Private house owners. A copy can be recorded on Disc or VHS and can be supported by a written report. Poorly concrete lined chimney - This was not lined by a NACE Registered installer.